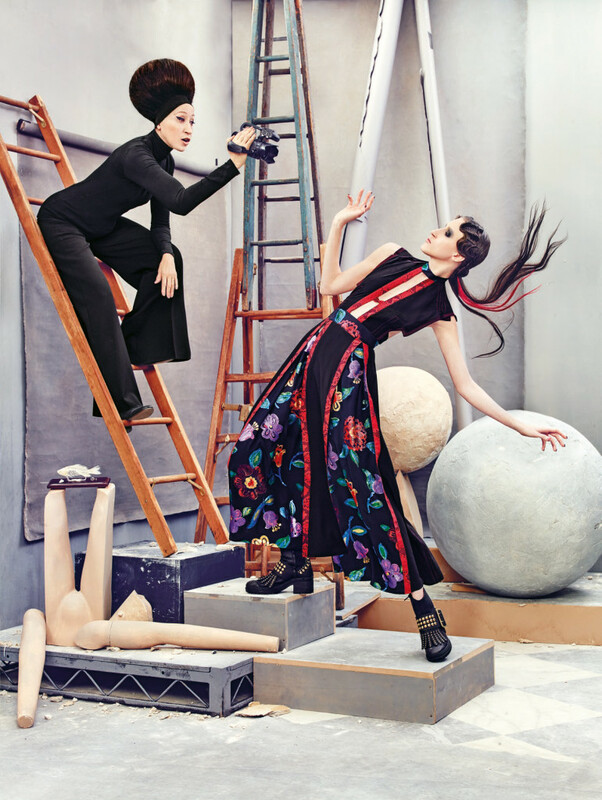 Photographer: Ruven Afanador. Model(s): Anna Cleveland, Pat Cleveland. Source: Neiman Marcus. Stylist: Isabel Dupre. Makeup: Joanne Gair. Hair: Italo Gregorio. 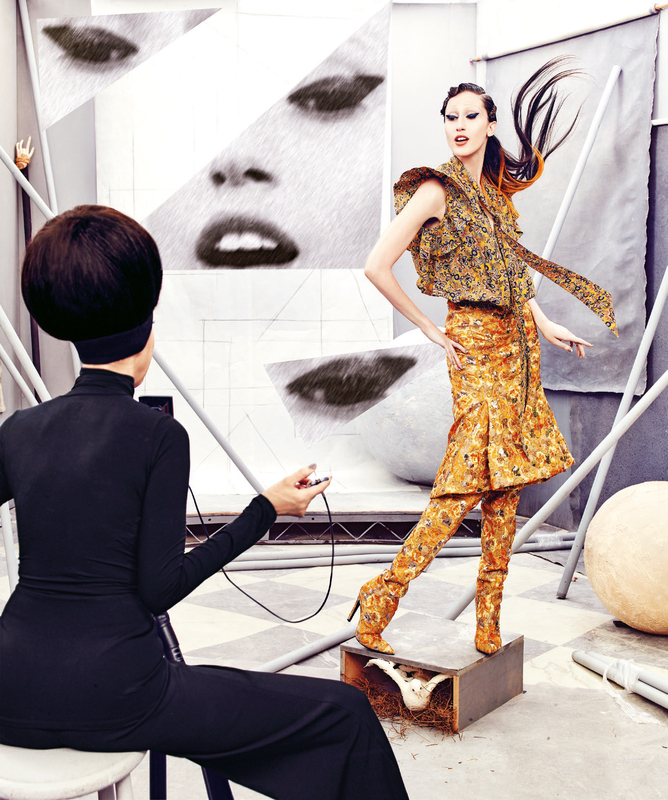 The Cleveland women celebrate the music of the muse in “The Art of Fashion” by Ruven Afanador for Neiman Marcus, 09/16. A dream inside a dream, “The Book” honors the many attributes of The Muse. Ruven gives us a unique peak at the wonderful women, with a video that takes us behind the scenes. Pat speaks with a sweet, lilting affect, “something’s ticking here and there’s someone I have to meet,” while, Anna goes inside in, “an intimate process whereby you become a vessel to release your ego.” They believe that being open to the process allows the brilliance of the moment to find you. This isn’t a search to uncover something rare, rather, it’s about giving yourself the permission to just be. It’s about finding freedom & syncing yourself to the rhythms of the universe. Isabel Dupre lets each piece speak with styles that are undeniably chic. Passion projects pure movement, as designs are draped over the bodies, with high fashion seeking a fluid form. Heart-shaped lips are drawn in perfect precision, as a fur mimics in poetic harmony. Vintage cameras flip the switch inviting the muses to make their move. Done in an artist’s studio, the mannequins are propped in backdrop as this story extols the virtues of a mother and daughter relationship. The art of beauty is realized as Joanne Gair focuses on the features of the face. Eyes come alive with extreme wings that can fly, while faux lashes celebrate the energy of the era. A cast of color surrounds the lids, from shades of citron to a circle of cerulean. Pastels project shadow only to be matched by candy colored wigs. Anna’s eyes evoke the pageantry of the Ostrich, with a muted, yellow tone that covers the entire orbital area. She stands on stilted legs, with limbs stretched, mimicking the exquisite features of this rare creature. Basking in the glory of gorgeous, red scorches the mouth as the mutiny of modern makeup begins. The hair’s the thing, as a bouffant blast takes us straight to the 60’s, with a bump that goes from brunette to red. Italo Gregorio divides the vibe from 40’s inspired finger-waves with a two-toned tale, to a blonde bob that hangs down in diagonal symmetry. A feast for the creative senses, the women stand in silent harmony, with a White Owl poised between them. Letting go of life’s limitations we let ourselves fly. In this memorable video capture, we’re witness to a special connection where Anna’s eyes are closed and Pat’s are open, at a moment that seems to stay suspended in time.